It might surprise some to know that Costco, seller of bulk foods and paper goods, is also a leading hearing aid clinic. In addition to their own brand of hearing aids at Costco prices, the Costco clinic offers hearing tests, a battery replacement program, and several other perks. The reduced price at Costco is highly tempting in an industry where prices go up yearly. While many other electronic devices become more affordable year to year, the highly specialized hearing aid industry often has to factor in dozens of additional costs. Everything from the audiologist?s 1 salary, to rent for their facility, to materials costs cause hearing aids to get more expensive year by year. Insurance does not typically cover the cost of a hearing aid device, and since some users (such as the elderly) are on limited incomes, the rising cost can become difficult. While hearing aids are not considered a medical necessity by providers, anyone who has used one can attest that they do wonders for quality of life. *More details on the costs below. The Costco introductory offers are admittedly appealing. Any of us can easily go to the Costco website to locate one of their over four hundred Hearing Aid Centers, located inside stores all over the United States and worldwide in several different countries. Costco has hearing aid centers in their stores in Mexico, Canada, Australia and even Japan. Any Costco member can call to schedule an appointment for a free, no commitment hearing test, simply to see if hearing aids would possibly benefit them. Any existing hearing aid user, even those from private clinics, can schedule time with a Costco hearing aid center employee to have a complimentary hearing aid assessment that includes cleaning and a fresh battery. For high-tech digital options, Costco customers can choose from Behind the Ear, Bluetooth Capable, or Open Fit devices. Costco users can also choose from battery replaceable hearing aids, to the top of the line chargeable models, with remote control. 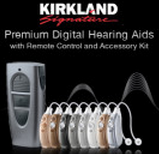 The Kirkland brand hearing aids are Costco?s own brand name, and the baseline for hearing aid purchases at Costco. However, lest users be wary of a hearing aid without a reputable brand name attached, all of Costco?s hearing aids are the same models as popular hearing aids Siemens, which also produces the popular Rexton brand. In addition to the competitive cost, all Kirkland brand hearing aids come with a list of perks and freebies. Costco?s prices include a pair of hearing aids, charger and dryer tools for the devices, cleaning wipes, carrying cases, ten classic style zinc batteries 2 , two rechargeable batteries and replacement receiver domes. Kirkland offers optional upgrade accessories, such as the ePen ? a tiny, discreet alteration to remote control technology, allowing users to adjust the settings on their hearing aids from the privacy of a pocket. Bluetooth connectivity is a relatively new upgrade to most hearing aids, allowing users to sync their hearing aid directly to a mobile phone, laptop computer, or other Bluetooth device. Such features allow for the hearing impaired to have additional sound piped discreetly into the device, giving the user the bonus sound they need to enjoy television or music without the worry of disturbing family or friends with loud volume. Costco?s clinics also offer free follow-up appointments, repairs, warranties, and trial periods for their devices. The qualifications of Costco?s hearing aid professionals are determined by state and local laws. In some localities, a licensed audiologist must handle the calibration and fitting of hearing aids, where in others, training and certifications are sufficient to allow a practitioner to measure and fit a user for hearing aids. Perhaps for this reason, some users report different experiences from one Costco to another. While this can be a problem for someone who goes from a positive experience to a negative one, Costco?s extensive network of clinics allows users to move from one clinic to another if they enjoy the prices and products offered at one, but perhaps would like a different clinician. Some users criticize the free hearing tests offered by Costco, comparing it to ?used car salesman? techniques. To this, Costco is quick to point out that their hearing aid technicians receive no commissions for sales. However, it is typically recommended to see a licensed audiologist for a full markup of tests prior to making the commitment to purchasing a hearing aid, if only to rule out other, possibly systemically dangerous causes of hearing loss. Most users seem to think the best course of action is to use Costco for a replacement hearing aid or second or third opinion, for personal health reasons. Costco has been staffing their centers with hearing aid clinics for over 20 years. Many customers and hearing loss sufferers swear by Costco?s pricing and customer service for hearing aid options, while many don?t even know of the service they offer. Costco?s hearing aid service is a full clinic, staffed by audiologists. However, with their Kirkland brand and lack of support costs such as extra staff and overhead, Costco is able to offer a variety of hearing aids at a fraction of the cost, as well as offering free visits and complimentary services. This often makes them a target of jealousy in the industry from private clinics, which often charge fees for office visits, cleanings, and frequent battery replacements. Some private clinicians criticize Costco?s place in the industry, however some Costco stores do indeed refer hearing aid users to local audiologists and Ear, Nose and Throat specialists as needed. The Costco hearing aid clinic seems to be a cost effective, customer service focused solution for those in need of hearing aids. However, if you feel as though you or a loved one is experiencing hearing loss or difficulties, there may be an alternate solution for you. Go to HearingLossPill.com to learn more about stopping the causes of hearing loss at the source. To find the closest Costco hearing aid center near you, please click here to make an appointment with the hearing aid staff. If you already have a hearing aid they also invite you in for a free cleaning and battery change. Q: Is there an obligation to buy with a hearing test? A: No. The hearing test is completely free and purchase is not required. There are many benefits for consumers who opt to purchase their hearing aids at Costo, whether they are selecting the in-house brand Kirkland, or one of the many other discount name brands that Costco offers. While consumers may have second thoughts about completing their audiology exam at the Costco centers, these discounted devices do make for a great replacement Hearing Aid, once users already know the style and brand that works for them.